The Hackney Flashers collective was set up in 1974 and created influential agitprop material in the 1970s and 1980s. The women in the group, described themselves as broadly socialist-feminist and most of them engaged in the creative media as photographers, cartoonists and writers. 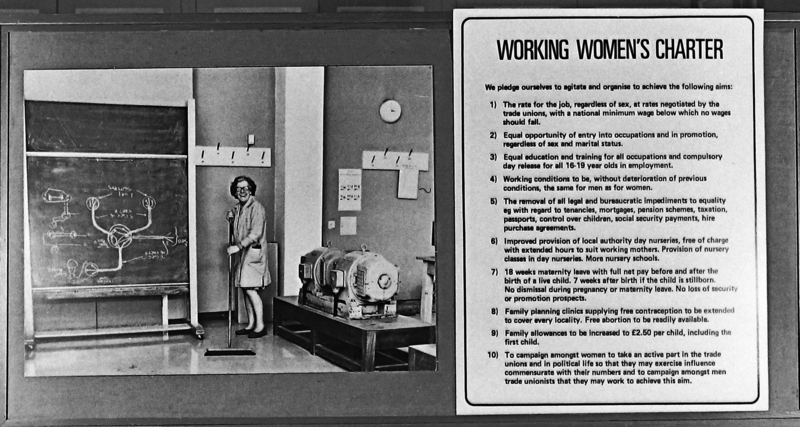 Women and Work (1975). A photographic exhibition of black and white prints and hand-written text making visible the huge, hidden role that women played in the economy, and making an argument for equal pay. Although it used simple ideas and basic production techniques it circulated widely and was welcomed and admired. It toured to many community venues and political events, including the 1977 Socialist Feminist International Conference in Paris. Who’s Holding the Baby (1978). The second exhibition was built on lessons learnt from producing ‘Women and Work’, and it reflected the group’s growing political and creative sophistication. Its subject matter, the lack of childcare provision available to working mothers, could not be addressed using documentary photography alone since the strength of documentary is its ability to reveal what is there. 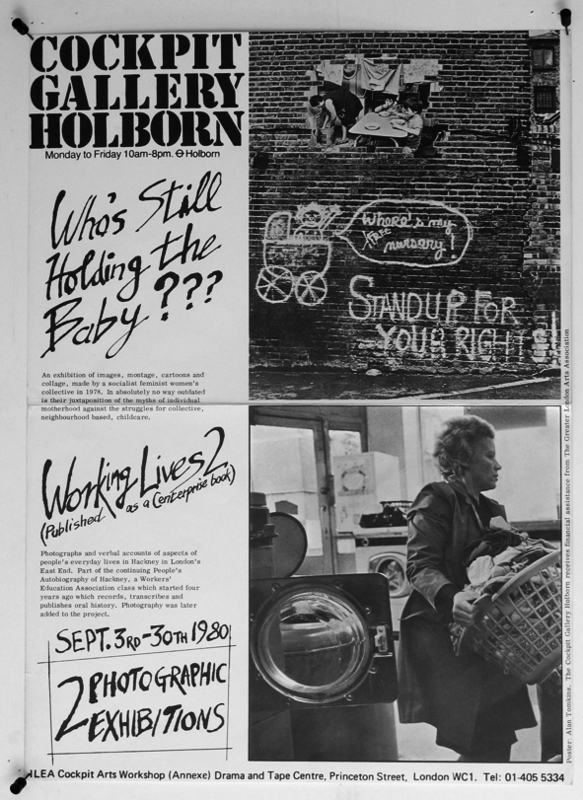 Montages, together with full-colour cartoons, were used with photographs documenting Market Nursery and its users in Hackney, East London in order to highlight the lack of childcare provision in the area and some of its effects. The twenty-nine-panel exhibition was presented on lightweight, laminated material designed to be robust and easy to hang in non-gallery settings. It was launched at Centreprise Community Centre in Kingsland Road, Hackney, London in 1978. It then went on tour to community, political and educational events and venues round the country. In 1979 it was included in, Three Perspectives on Photography at the Hayward Gallery in London. This attracted controversy and some criticism from the art establishment. 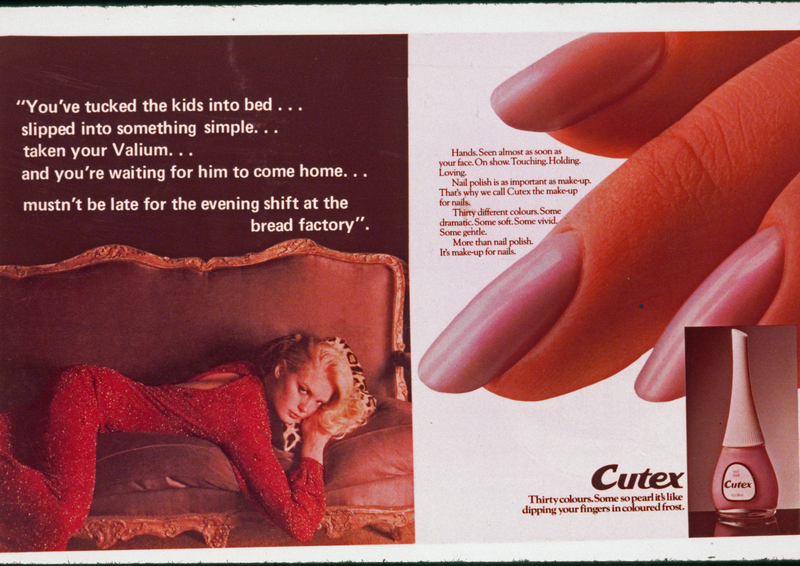 Domestic Labour and Visual Representation (1980). Following requests from different sources the collective produced an education pack (24 slides and a booklet) using the work of the Hackney Flashers. This was particularly intended to encourage students’ active, critical participation in the subject portrayed and also the issue of representation. The origins of the Hackney Flashers lie in a meeting of photographers and an illustrator called by Jo Spence and Neil Martinson (both photographers) in 1974 to discuss creating a photographic exhibition of women working in Hackney. Hackney Trades Council were organising an exhibition to celebrate their 75th anniversary. It was imperative that the contribution of working women be acknowledged in the exhibition. Soon a designer and a cartoonist, a writer and an editor also joined the group. Members came from a variety of professional occupations: university teaching, community photography, freelance photojournalism and publishing; some were active trade unionists or involved in political campaigns or groups within the Women’s Liberation Movement. Early in 1975 the collective decided on the name Hackney Flashers. Members were: An Dekker, Sally Greenhill, Gerda Jager, Liz Heron, Michael Ann Mullen, Maggie Murray, Christine Roche, Jo Spence and Julia Vellacott. Others collaborating with them at different times were: Helen Grace, Maggie Millman, Jini Rawlings, Ruth Barrenbaum, Annette Soloman, Arlene Strasberg, Chris Treweek. Two men took part in early discussions before the collective was formed. Neil Martinson was the main contact between the group and Hackney Trades Council. Terry Dennett of Photography Workshop did not join, but was an observer at some initial meetings. The aims and politics of the Hackney Flashers developed – sometimes through robust argument and dissent. Members came from differing class and political perspectives – some rooted in the left, others exploring feminism. Liz Heron wrote about this in a 1979 article, ‘Who’s still holding the camera?’ She also offered an explanation for why the name was adopted. Uncovering hidden work and unrecognised dynamics was part of the group’s agenda – hence Flashers – which is also a derogatory name for photographers that was waiting to be reclaimed. The group was based in the east London borough of Hackney. It was unusual at that time for women to be photographed at work, even more so for the photographer to be a woman. Women’s contribution to the life and prosperity of the country also went largely unrecognised. Many of the Hackney Flashers photographs and illustrations brought women’s work to light (in the first exhibition); and highlighted how much hardship was involved in managing both childcare and work (in the second). The Hackney Flashers’ work aimed to produce campaigning and educational material for use in community centres, schools, trades union events and alternative venues. Panels were displayed in town halls, health centres, at conferences, in libraries and at the Hayward Gallery (see below). In designing the second exhibition and the slide pack the group became involved with issues of representation and subverting imagery. The Flashers grappled with how to show loss and lack visually. The group worked in a co-operative, skill-sharing way – ‘the personal is political’ was an idea central to the activism of the time. This was a very unusual experience for women in the media, most of whom in the 1970s and 80s were hardly visible and often isolated. Members of the collective went on to develop their own careers or move into new fields. Many carried the ethos and some of the methods of the Hackney Flashers into these areas. Sally Greenhill worked as a photojournalist, Liz Heron became a journalist and literary translator and is the author of fiction and non-fiction books; Michael Ann Mullen became Photography Officer at the GLC and later lectured in history of photography at Middlesex University; Maggie Murray (with Val Wilmer) set up Format Photographers – a women’s photo agency; Christine Roche continued as a cartoonist and taught in various colleges. She now paints. Jo Spence produced books and exhibitions on health and representation. She died in 1992. An Dekker left England and became a sculptor, dying in 2012. Julia Vellacott was an editor at Penguin Books. Collaboration between some of the Flashers went on for many years. They continue to meet formally and informally. The impact of their work has been recognised internationally and an early copy of ‘Who’s Holding the Baby’ was acquired by the Museo Reina Sofia in Madrid in 2010. It is now on permanent display there and features on the museum’s website. Liz Heron, Who’s still holding the camera? in ‘Photography Politics: One’, (London, Photography Workshop, 1979). Republished as ‘Quién se ocupa de la cámara?’ in Fotografía y activismo, ed. Jorge Luis Marzo, Editorial Gustavo Gili, (Barcelona, 2006).